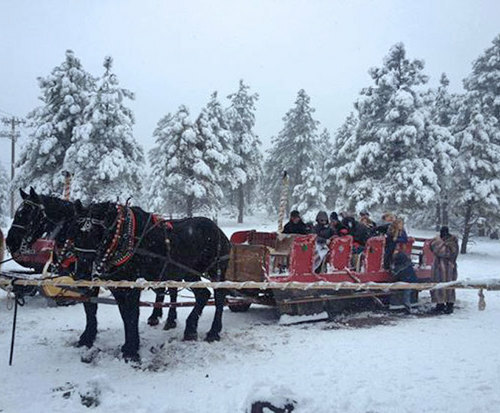 Coconino National Forest Sleigh Ride at Hitchin' Post Stables is no longer available. 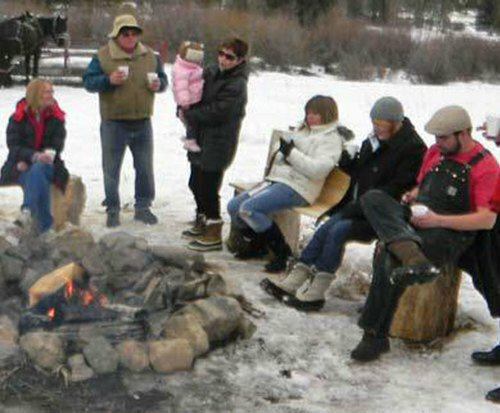 Get all bundled up and venture out to Hitchin' Post Stables for a horse-drawn sleigh ride through a the snow covered Coconino National Forest. 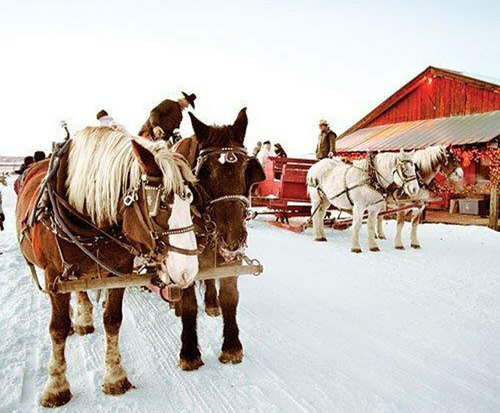 Sit back and relax as you embark on a horse-drawn journey through the most beautiful of winter wonderlands. The Coconino National Forest is certainly a sight to see during the wintertime. You'll whiz past heavy pine branches weighed down with sparkling snow as the horses pull the sleigh through the snow dusted ground. The sounds of hooves beating the earth and merry sleigh bells jingling will ring through the crisp mountain air as your brisk ride heads toward the cowboy camp area. Once you arrive at camp, cozy up by the fire and wrap your fingers around a warm mug of hot cocoa while you rest and stretch your legs. Once your nose and ears have had some time to warm back to life, you'll pile back into the festive sleigh and make your way back to the main stable area. A brisk horse-drawn sleigh ride is the perfect way to spend the holidays with family as you explore the beautiful Coconino National Forest. It's recommended that guests dress warmly. Boots, heavy coats, hats, scarves and gloves are ideal. Located in northern Arizona, this 1.856 million acre national park was designated as a U.S. National Park in 1908. The forest is divided into three different geographical districts, each of which has its own environment and landscape. The national forest was named because of its location in the central part of Coconino County.